All those who didn't get to the Camden Meet missed out so badly! Leonard turned up to say hello and stayed and let us take pictures and signed things. What can I say I am so sorry for those who were gonna go and maybe because of trains etc didn't make it. Great great day but I am too knacked to give you the run down but lovely to see everyone again and thank you so much Jarkko for some how persuading the Man to attend the meet. I have a lovely picture of Leonard with my daughter he is really smiling. Megan had just said to him I am wearing heels I will crouch down and Leonard said no thats OK I will stand on tiptoes. and were very happy and honored to have Leonard joining the meetup at The Green Note Cafe. your messages on this forum. What a marvellous gesture by Mr Cohen. It is difficult to imagine any other singers doing such a thing on the night when they are to appear in public. Yesterday was such a wonderful day. Thank you to everybody for making me feel so welcome. It was great to meet everybody so thanks Diane and Padma. When I was in the Green Note Care and glanced up and saw Leonard Cohen I thought I was dreaming, but it was him! 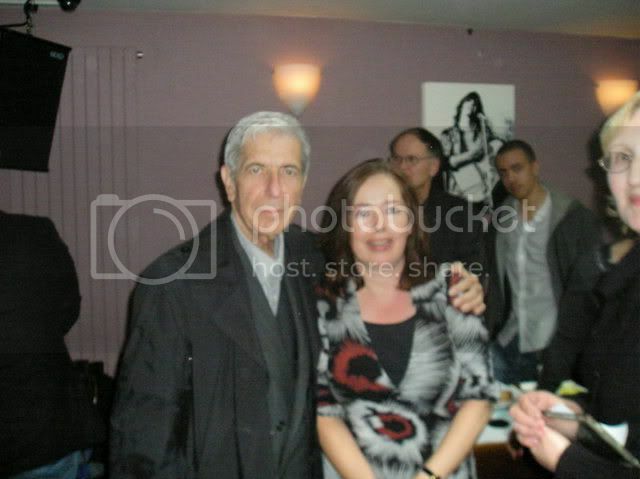 Never in a million years did I think I would meet Leonard Cohen, so many many thanks to Leonard for making the effort. He chatted to everybody and posed patiently for photos and signed autographs. When it was my turn all I could think of to say was that it was a great pleasure to meet him. He asked me my name, Leonard Cohen asked me my name, now he has to write a song about me, forget Marianne and Suzanne, next it's Laura. I look a bit petrified in the photo, well I was petrified. Thanks to Megan for taking the snap. The Phillip Glass concert was excellent and I really enjoyed it so thanks to Mickey for letting me have a spare ticket. I'm off to Turkey on holiday soon and I look forward to seeing other reviews when I return. Thank you so so so much to everyone for a such a really wonderful day. I know exactly how you feel, Laura .. Leonard Cohen asked me my name !!!!! Can't believe it !! !I Will be back home next Wednesday and be able to thank you all properly then. Yes, yesterday was a truly marvellous day - moreso for some than for others, but I'll come to that later. Soon after we arrived, Pete sneaked onto the stage hoping nobody would notice and began an excellent set of Cohen tunes. He played the first few straight off without a break, and then got very embarrassed when he finally paused for breath and we all applauded. You really don't need to be so bashful, Pete, you're good! Unfortunately, we had to leave before the end of Pete's set, as we had timed entry tickets to visit the travelling exhibition of the Terracotta Warriors from the tomb of the first chinese Emperor. Yes - that's right. We left! We missed meeting Leonard Cohen in order to see a load of clay statues! We rejoined the others (the lucky b....s) at the Barbican in time for the pre-show talk. This was billed as Philip Glass and Leonard Cohen in conversation, and I was not sure whether that meant in conversation with each other or with the audience. In the event, it was neither, or both, depending on how you looked at it. There was a journalist (whose name I unfortunately didn't catch) who acted as a sort of interviewer/facilitator and did an excellent job. I have since learned from a posting by richardrj on anothe thread that his name was John L Walters. The three of them arrived on stage to a standing ovation. I bet that doesn't happen often at pre-show talks! I wonder if Leonard knew that most of it was for him. I hope he did. He was wearing a silver-grey suit with a paler shirt and no tie, and he sat for almost the whole time with his hands clasped between his knees, reminding me of nothing so much as an errant schoolboy called to the headmaster's study. John Walters asked intelligent questions that allowed Philip and Leonard to talk about the genesis of the piece then invited questions from the floor. I felt rather sorry for Philip Glass then. All the questions except one were for Leonard, and he fielded them with his usual blend of wit and charm, though after several questions had been posed in the evident belief that he was now a Bhuddist he did state quite categorically that he is not interested in bhuddism per se, that he only became a monk in order to be close to Roshi on appropriate terms, and that he already has a perfectly good religion thank you very much. (There were a couple of empty seats in front of us for the actual performance. I hope he didn't offend anyone, but if he did, I would think it was their problem rather than his.) Let me see, what else can I remember? I know he said he hoped to be touring next year, but then, he said that last year too. He was asked to recite 'A Thousand Kisses Deep' and obliged with three or four verses to great applause (he said he wouldn't subject us to the full 80 verses). It transpired that as part of the creation process for this work, Leonard had recorded the whole of the Book of Longing onto 4 CDs so that Philip could pick the bits he wanted for the performance at his leisure. One questioner asked if there was any chance that these could be made available commercially, and Leonard quipped "yes, if Philip will provide an arpeggioed background". He probably meant this as a polite "no", but I wonder if he could be persuaded to change his mind? Judging by the audience reaction, there would be a ready market for them. They also mentioned that they have already been discussing the possibility of setting parts of Beautiful Losers to music. We probably shouldn't hold our breath, as the current project was six years in gestation, but it's a mouthwatering prospect for the future. At one point Philip mentioned having had a bad review in London, and Leonard countered with the terrible review he got after the Isle of Wight festival, when one person wrote that "Leonard Cohen is a boring old drone, and should go the f... back to Canada where he belongs." This was met with embarrassed titters from the audience, who would have loved to show their solidarity with Leonard, but what could we do? Applause is generally taken as agreement! John Walters, bless him, came to our rescue by commenting that this must have been an all time low for british journalism, and this we could (and did) cheer vociferously. The discussion ended all too soon, and the trio left the stage, again to a standing ovation. I approached the main performance with some uncertainty. We had met Anne from Canada on her way to the Green Note Cafe just as we were leaving. She had told us (was that a hint of a shudder in your voice, Anne, I was not sure at the time and am even less so now) that this was "modern" music, so I was a little concerned that we were in for an evening of dissonance and caterwauling. Far from it! The piece was tuneful, not to say lyrical in parts, with some very powerful settings, particularly of 'Puppets' and 'A Thousand Kisses Deep'. I liked the instrumental solos, which were each associated with a recorded reading by Leonard. I particularly liked the clarinet one, which followed Leonard's reading of 'Not a Jew'. I was less sure about the one on the double bass, but as this was one of the few occasions when people were moved to break the taboo on applauding during the course of a 'serious' piece of music, I take it I was in a minority there. The singers were excellent, and I particularly liked the way they moved about the stage and interacted with each other physically as well as vocally. Just before the piece started, a slight figure in a silver-grey suit emerged from backstage and took an end of row seat towards the rear of the auditorium apparently unnoticed by most people (he had a minder with him, so no lucky concert-goer got to sit next to the Master!). The piece ended to generous applause as the performers took their bows, but this became a standing ovation when Leonard himself was brought onto the stage, and it continued for some time. I'm not saying that the piece did not deserve every bit of the applause that it got, but I think people were just so very pleased to see Leonard out and about again. We were unfortunately unable so hang around long after the end of the performance, as we had a long drive back to Gloucester, but I think I heard one person say that they would have been happier if it had been Leonard up there singing his own songs. (Please forgive me if I misunderstood, or if I am misrepresenting you.) Of course we would all have loved it if it had been Leonard, but we knew when we booked that it would not be, and I think it is unkind to criticise a piece for not being something it never set out to be. For me, it was a very affirming experience to hear Leonard's words so powerfully expressed by others in such a very different medium, and I hope that a recording of this piece will soon be available, as I would love to hear it again. Last edited by linmag on Sun Oct 28, 2007 1:36 pm, edited 2 times in total. Yes, it was a surreal moment at the Green Note Cafe. I was standing, talking to someone at a table with my back to the door, when her face went blank, and then in a dazed monotone she managed to get out the words "Leonard Cohen is behind you." He spent at least half-an-hour with us, and it wasn't just waving and smiling, but genuine conversation. I asked him if he had been back to the island since 1999, and he said no. He was then able to give me some news about someone I haven't seen or heard of since the sixties. The Green Note is a lovely place, very small and intimate, hosting young up-and-coming singer-songwriters, just like the Troubadour did in the sixties and seventies. One thing I noticed was that after Leonard arrived, the staff were walking around in a bit of a daze too! They were clearly just as appreciative as us. After Leonard left in his taxi, one of our number actually danced for joy on the pavement, both feet in the air, the first time I have seen this well-worn expression actually happen in real-life! As for the concert itself, I had mixed feelings. I thought the slide-show was outstanding. Some parts of the composition I thought were very good, such as Puppet Time, This Morning I Woke Up Again with its lovely apology, and the epilogue Merely A Prayer, but much of the rest was, frankly, unsophisticated, at times dangerously redolent of Andrew LLoyd-Webber. The voices were exceptionally good, but it seemed to me that Philip Glass has been unable to shake off his background in modern opera. He was, after all, supposed to be writing an oratorio. This feeling was reinforced by some strange antics on stage, with the violinist wandering about like a troubadour, and (for two of the songs) the cellist playing with her back to the audience. Given that the work was composed after Ten New Songs (published in 2001) was issued, I remain totally baffled why Philip Glass chose to re-compose four of the songs from that album (Boogie Street, Love Itself, By The Rivers Dark and an extended version of A Thousand Kisses Deep), when there are so many other good unsung poems in the book from which to chose. His version of Boogie Street interested me, but the other three made me wince. And it was noticeable that the standing ovation at the end was for Leonard, not for Philip Glass. And that is when I realised that the person who I would really like to have composed this piece is not Philip Glass but Carl Orff. When you think of the sacred and profane text which inspired Orff to write Carmina Burana, it is not a hundred miles away from the Book of Longing. What an amazing collaboration that would have been. Of course, there is something else to consider. Many in the audience were Glass fans being introduced to Leonard's work for the first time. so it is hardly fair for us to be too critical. In terms of bringing new readers to Leonard, I would say the concert was an outstanding success. And, as a reward for those who have had the patience to read this review in its entirety, I have left the best bit to the end. During the question and answer session in the pre-concert talk, Leonard said: "I have some plans. God willing, I will be on tour next summer." Note this time he didn't say he hoped to be touring next summer. He said 'will'. Last edited by hydriot on Sun Oct 21, 2007 3:05 pm, edited 1 time in total. OHHHHH... great day, great day, GREAT DAY ~ for ALL of you!!! Laura ~ you're beautiful . Tony's right, too... how unlikely for anyone else to even CONSIDER doing such a thing, much LESS actually DOING IT!!! First Class all the way, Leonard . Yours appeared as I was writing mine. I went ahead and posted mine before reading yours... all the way to the end. Excellent synopsis from my perspective... and, as Linmag's and yours clearly show, some actually DO enjoy Glass's work, even on this project. I'm so glad to see that you got to speak with Leonard on more personal matters. Yours is an excellent synopsis, too, Linmag. I can't believe you came so close to meeting Leonard and missed . I'm guessing at least one of those empty seats was Ken's... and nothing related to Leonard's or Philip's offending anyone in the Conversation.
" . . . and he sat for almost the whole time with his hands clasped between his knees, reminding me of nothing so much as an errant schoolboy called to the headmaster's study." I remember this position so well from Toronto. Great analogy and one that never would've occurred to me. It registered with me as "humility," without the pending-discipline connotation attached . This is all so astonishing. I need a cup of coffee. 'Gutted' doesn't begin to cover it, Lizzy! To me, even at 72, Leonard retains a little-boy-lost, almost puppyish quality that makes me just want to reach out and hug him, or pat him on the head or something. Come to think of it, it's probably just as well that I didn't get to meet him yesterday . Congratulations to all of those who managed to meet the "surprise guest" at the gathering. I'm sure everyone was really cool and laid back until he left. What a surprise party that must have been for all of you! When I learned that Mr.Cohen joined some of you lucky guys at the café, tears came to my eyes. I've been very sad not being able to get to the concert and meet you fellows but I never expected something like that to happen at all. It must have been such a great experience! I'm very happy for you! Thank you, Linmag and Hydriot for your excellent summaries and Laura for sharing the wonderful picture! Last edited by ispellit on Sun Oct 21, 2007 7:40 pm, edited 2 times in total. That would've been too funny, Linmag . I'm gutted with you for you on not meeting him ~ I mean, who would have dreamed!?! That's what made it even extra special . I agree that Leonard does still retain a little-boy quality that endears people. I keep wanting to move that camera over just a smidgeon to get the rest of Paula's face. Looks to be a really good picture of her if it had made it. Was that Megan taking it ? Yesterday turned out to be a very very special day. There are so many images and memories in my head that will stay with me. It was a wonderful gathering of Cohenites...some I had met before, others who I had promised to meet one day and others who I only knew by name (or nickname!) ...and yesterday was the day. ..and the main Cohenite himself making a guest appearance. To meet Leonard for the first time in my life was something I had resigned myself to never happening but there I was shaking his hand and telling him that it had taken over 30 years for me to actually do that. I did try to work out exactly how many years but my brain went all scrambled and I played safe rather than embarrass myself and do a wrong mental calculation (which would have been more embarassing with me being a mathematician!!). Paula took a photo of the two of us. Her camera is now broken but the memory card remains intact (he hopes!!!). I did sneak an extra chat with him whilst he made his way out and this time my brain was in gear. then, as a complete musical piece, it will blend and grow. There were many musical nuances amongst it all that will start to surface. I would guess that little extra chat you snuck in with Leonard must have focused on the merits of Ovaltine! Good for you Pete and can't wait to see the pic.